A person is required to take a lengthy Trapper Education Course prior to obtaining a trapping license. Wildlife trapping is governed by municipal and provincial/ territorial regulations which incorporate rules on safe use of trapping devices including placement on public lands. Canada is a signatory to the 1997 Agreement on International Humane Trapping Standards (AIHTS) which requires certification of traps based on scientific results of trap testing. Traps are being tested and certified in a scheduled manner. A list of certified traps is updated regularly. Why do we need to control urban wildlife? Animals are quick to adapt to urban or semi-urban settings where they can easily multiply. Too many animals in an area can cause problems. Reducing over-abundant wildlife populations helps reduce the damage they cause through flooding, livestock and pet killing, and public health risks such as rabies or giardiasis. Human-wildlife conflicts range from nuisance issues to health and safety issues. Prevention is the first line of defense. There is a wide range of information and products available to the public to help minimize human-wildlife conflicts. Prevention may only be a part of the solution. Further measures may be necessary in the case of human safety risks (disease, attacks), habitat destruction (beaver damage) or endangerment to other wildlife. A variety of options currently exist for dealing with problem wildlife. These include poisons, noise and light deterrents, altering habitats, introducing predators, or capturing. Capturing (trapping) problem animals is often an effective, ethical and sustainable option. There are different types of traps but not all are useful in all circumstances. Many municipalities that have trapping bylaws make exceptions for farmers, homeowners, and licensed trappers. What about the cost to municipalities and taxpayers? Regulated trapping is cost effective. Fur animals can cause significant costs annually in flood damage and livestock killing, and can pose a risk to public health and safety. Taxpayers ultimately pay for such costs. Trapping is one wildlife management option used to prevent or to stop such damage at little or no cost to taxpayers. What are the problems with trapping in urban areas? Each jurisdiction is responsible for wildlife management, including pest control. The rules vary among jurisdictions. Relocation of trapped animals may be restricted by law. The use of traps in high traffic areas increases the (low) risk of capturing free running pets. Human interference – traps and or captured animals can be illegally moved. Lack of municipal or provincial inspections can mean some illegal traps may be used or traps used improperly by property owners or unlicensed trappers. A bear was shot by police in the backyard of a home in Newmarket, Ontario in May 2015. A 400-pound bear was shot by police in May 2012 after it was found in a Toronto area public park. A teenage girl was attacked in a London park by a coyote in May 2015 that knocked her to the ground and bit or tore at her face and arm. An 8 year old girl was bitten by a coyote while playing in an Oakville backyard in February 2012. 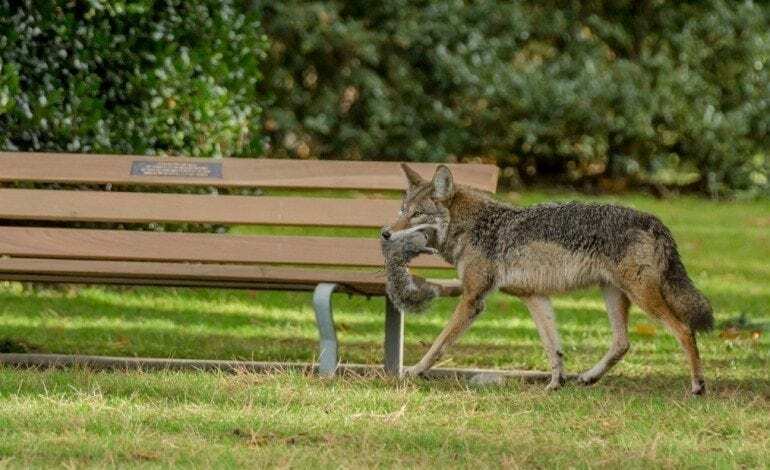 A pack of nine coyotes went after a woman and her three dogs walking on a trail in an Edmonton neighbourhood in March 2014. One dog was injured by the coyotes. The derailment of a Canadian Pacific Railway Ltd. train in Burnaby in January 2014 was blamed on the washout of a beaver dam due to heavy rain. Seven cars went off the tracks and spilled coal into a creek that feeds a lake. A series of beaver dams washed out a section of Terrace Road in East Ferris Township in May 2014. The total bill neared $30,000 – the equivalent of a 1% tax levy increase for the small Ontario municipality of less than 5,000 people. Over five months in 2014, 30 grazing cows had been killed by wolves at a community pasture near Cooking Lake, Alberta and many others had been traumatized by the attacks costing the farmers about $200,000 total. Parks Canada reports there were 1,250 wildlife conflict occurrences in Banff National Park in 2014, with almost half of them involving black bears and grizzly bears. That compares to a total of 924 occurrences in 2013. The number of bear related occurrences almost doubled from 272 in 2013 to 577 in 2014. At least three dogs were attacked by wolves in the area around Pacific Rim National Park in March 2015. One of the dogs was killed while the others recovered. A Vancouver Island cougar attacked a toddler in the family’s yard in September 2015. The cougar was located at the scene and killed by Conservation officers. A Canmore, Alberta 20-year-old used his bike to fend off a cougar just metres away from his home in January 2015. In October 2009, a young woman was fatally attacked by three coyotes in Nova Scotia Cape Breton Highlands National Park, the second only death by coyotes recorded in North America. Wildlife species can also carry diseases that can be transmitted to people through pets or animal droppings. These diseases includes rabies, canine heartworm, distemper and parasites such as mange, ticks and raccoon round worm. Although relocation has been successful for some species such as bear and elk, it is relatively ineffective for other species. Often, animals will simply try to return to their original locations. Relocation may result in death for introduced animals due to stress, starvation, hostile encounters with resident member species. Relocating animals increases the risk of spreading diseases such as rabies, mange, distemper. The Canadian Federation of Humane Societies, the World Wildlife Fund, and most major animal protection and conservation organizations agree that relocation is not always the best course of action. Many jurisdictions now limit or prohibit the relocation of wildlife unless for special purposes such as well supervised conservation work with threatened and endangered species. How are public safety hazards minimized? Harm to the public caused by traps is an infrequent occurrence and often associated with improper/illegal trapping practices or risky human behaviour. Minimum set-back requirements for placement of traps on public lands are included in provincial/territorial regulations. Some public spaces post signage when urban trapping is occurring. Box or cage traps are mainly used for capturing wildlife in urban/suburban areas where there may be a risk of capturing curious unleashed pets. They are effective for capturing certain smaller animals, but can also be less selective than restraining foot hold traps. Use of qualified licensed trappers ensures traps are used safely and in accordance with rules and regulations.